The baroque art movement has persisted for over two centuries and still popular to this day all over the world. The Baroque technique refers back to a significant era when art was portrayed in its most beautiful and theatrical glory. 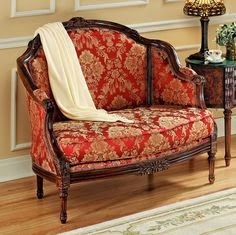 The enthusiastic and dramatic Baroque style first began in Italy and from them influenced a variety of countries around the world. English fashion designers discovered their new ideas in traditional books about Continental ornaments. A unique sense of drama and a distinctive ornate style characterise the technique that is Baroque. Within the decade in which this trend first became popular Interiors were lavish with rich velvets and highly embellished furnishings teamed with patterned wood. 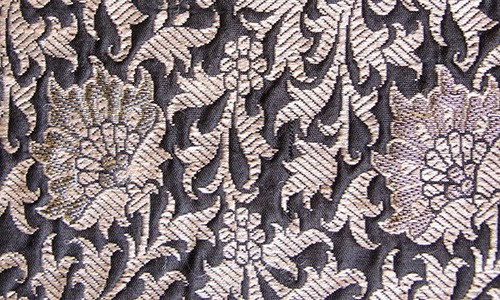 In relation to this, within Indian techniques and design, the technique of brocade within Indian fashion design is extremely popular and similar in aesthetic. The process begins with a simple pencilled design, it is then transferred onto a larger sheet of paper that shows magnified detail of the weft colours. Tanchoi fabric is used to produce Tanchoi sarees, which was first introduced to Varanasi in the early 20th century. Indian Designer Rohit Bal has showcased a number of stunning collections, which feature brocade throughout a number of the garment designs. Rohit’s signature stunning needlework and traditional silhouettes are used, created garments such as floor sweeping anarkalis with gorgeous and extremely traditional brocade detailing. 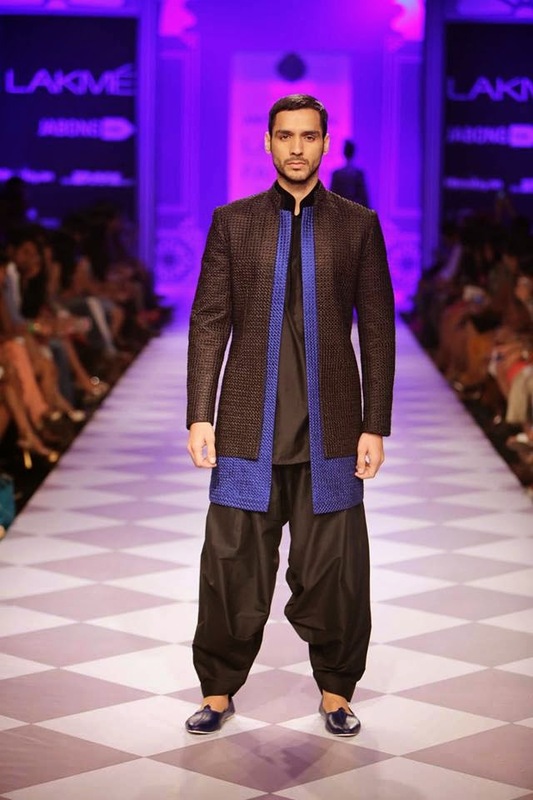 Proving that the trend is still very much in tact after all theses years, especially within Indian fashion design. Current popular bridal trends were seem to be swarming the runways showcased rich velvet textures, chandleries, and heavily textured brocades, teamed with luxurious silks and delicate embroidery which definitely ruled the ramps. 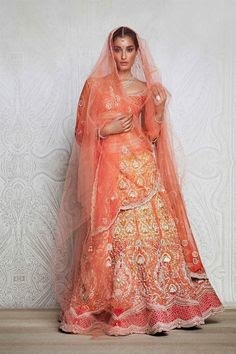 While a number of designers are innovating their Indian fashion design style, and brides are now prepared to experiment more quirky and vintage styles such as brocade, silhouettes that are ultimately overshadowing bridal trends are a blend of both old trend and charm teamed with contemporary styling. 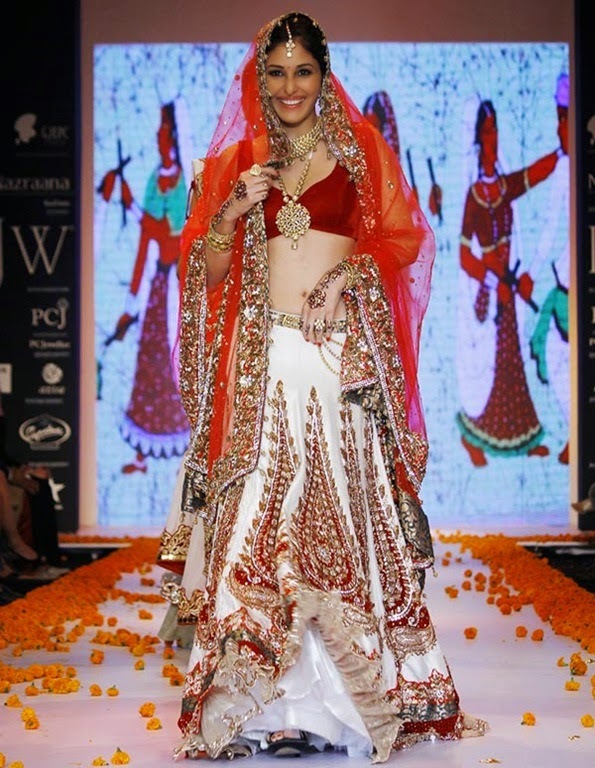 India’s international jewellery Week 2014 has recently taken place and it was certainly was not one to be missed. A huge array of models showcasing gorgeous Indian designer jewellery collections of all shapes and sized sashayed down the ramp at the fifth edition of the India International Jewellery Week. 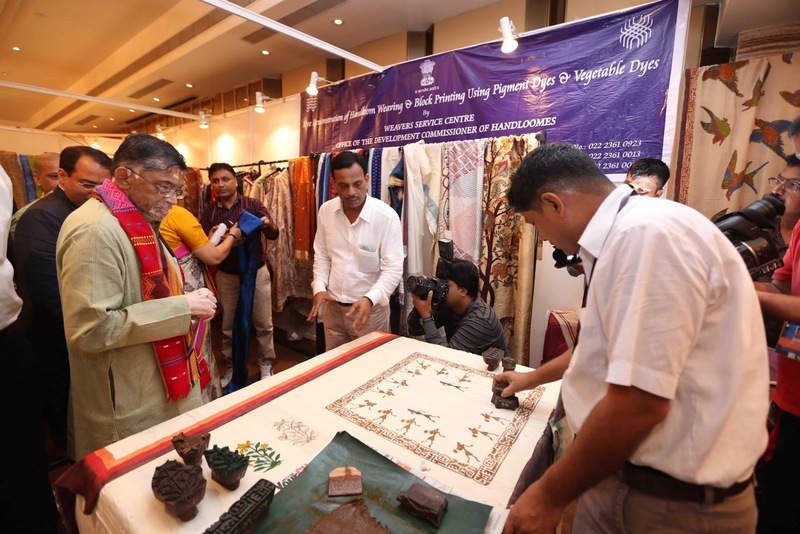 A unique variety of jewelers, designers and design graduates from the Indian Institute of Gems and Jewellery presented their creations at the event hosted by the Gem and Jewellery Export Promotion Council. The Indian jewellery designers produced the most essential and inspirational jewellery to date, making a statement across the globe. India’s international Jewellery Week provided a perfect international platform for India's most talented designers and design houses to showcase their original and contemporary Indian designer jewellery collections. The shows took place over a spectacular four-day period, from July 14 to July 17, and featured from of Bollywood’s hottest stars. Day 1: Our favourite show from day 1 had to be Sunny Leone’s collection, full of black magic and darker tones, the statement gold and silver pieces were beautifully designed, and perfect for dressing up a simple outfit and standing out from the crowd. Day 2: Day two of event featured a stunning array of Indian designer jewellery collections, but Swarovski definitely stood out to us as being the number one show stopper. The ballroom of the Grand Hyatt was transformed into a marriage Mandap with masses of marigold streamers dangling from the ceiling. 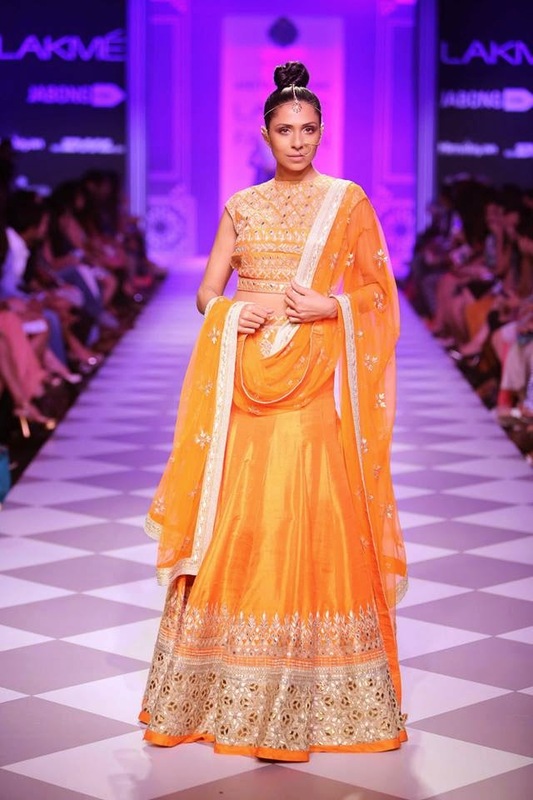 The runway ramp was edged with a gorgeous border of marigolds, setting the stage perfectly for a mega wedding style celebration, which featured a number of brides from all around the country. 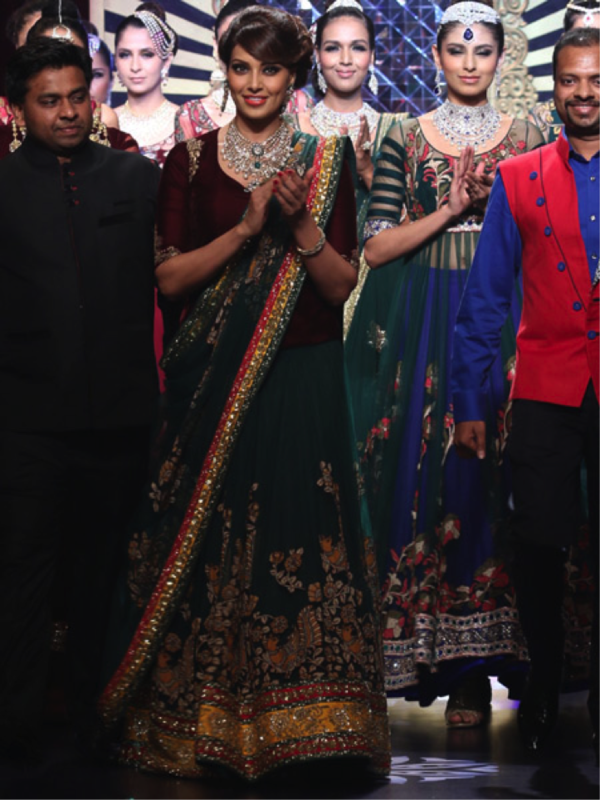 The Swarovski “The Brides of India” collection was presented by Nazraana in association with P C Jeweller, and was a mind blowing combination and variety of genuine jewels and synthetic stones all beautifully crafted. The colour, detail, sheer beauty and cut of the stones were a breath-taking view on the catwalk as the models strutted their way down the runway. Day 3: Sonam Kapoor, Sridevi and Parineeti Chopra took to the ramp on Day 3, making it a day to remember! Our favourite show had to be by Golecha Jewels. The collection consisted of stunning oversized and detailed traditional neckpieces, which were displayed with deep oranges and reds which made the richness of the gold stand out beautifully. And lastly, our favourite of all the shows took place on the last day of IIJW. 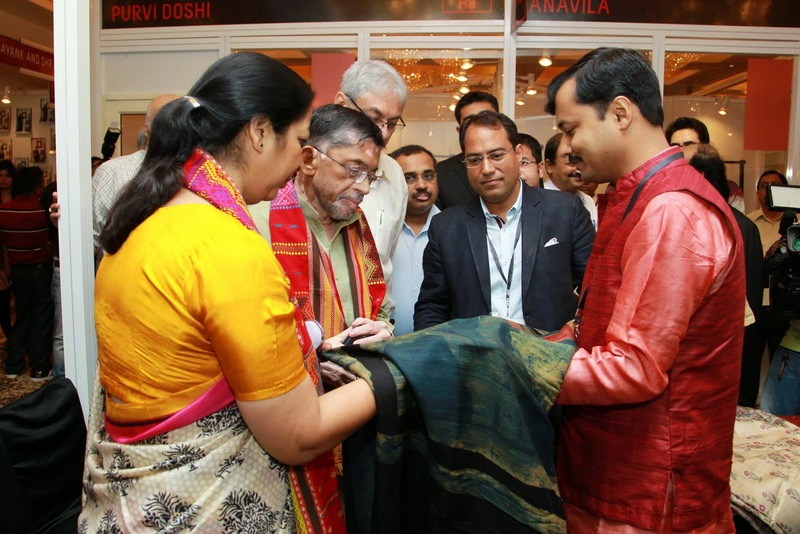 It featured one desired and standout piece of Indian designer jewellery from each of the many stunning collections shown in the first three days of India International Jewellery Week 2014. There were 21 items altogether from the different brands and Indian jewellery designers that were there to make their mark in the global jewellery scene. 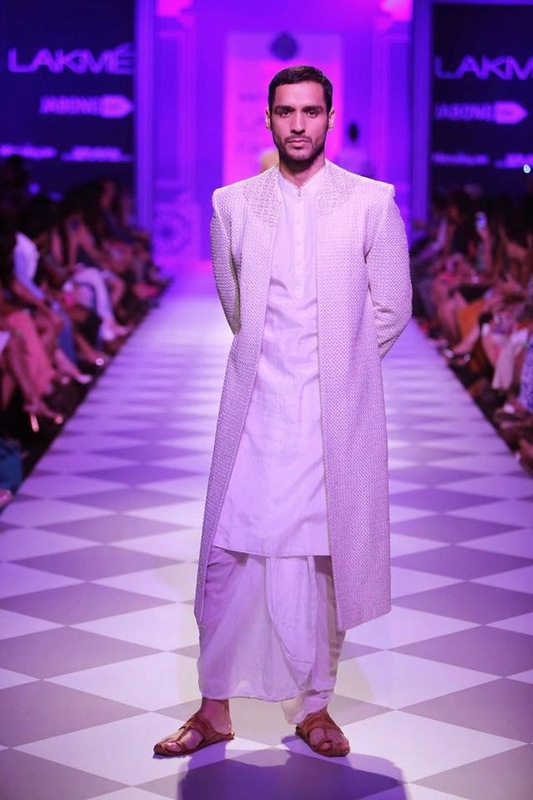 One of the best-known Indian designers at the forefront of the Indian fashion scene for over 20 years, Anita Dongre, was present once again to display her latest collection at Lakme Fashion Week Winter Festive 2014. She participated not only as a designer but she is also on the Advisory Board of the event. Indeed her experience and her knowledge are incredibly valuable for the management of such an event. 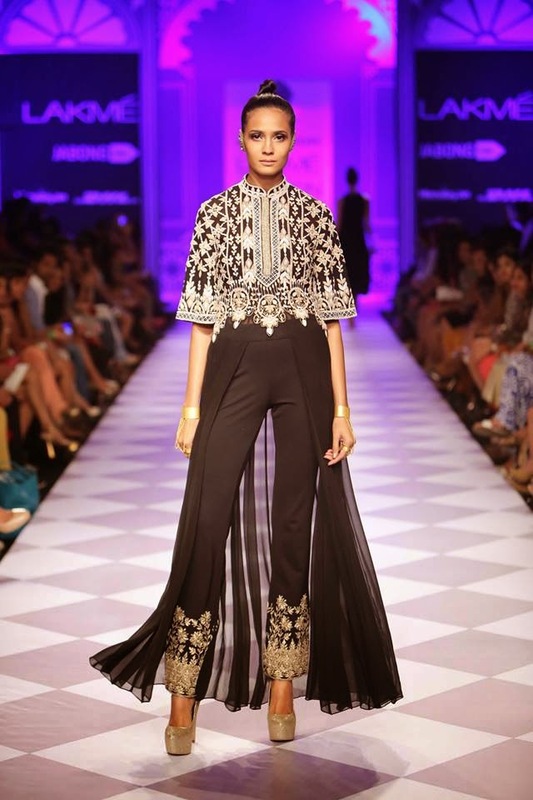 As her passion to contemporise Indian heritage, she showcased her latest beautiful collection called “India Modern” on the third day of Lakme Fashion Week Winter Festive 2014. This collection celebrated Indian crafts and textiles in a modern context with contemporary designs and shapes. 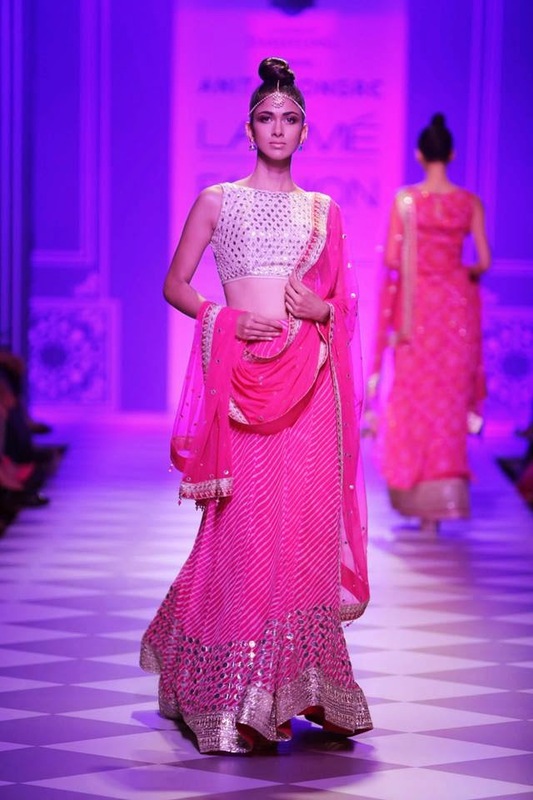 Anita Dongre brought to the runway beautiful Indian clothes such as bridal lehengas paired with crop tops, embroidered pants, couture gowns etc. All made with fabrics, colors and techniques that show the talent of the Indian craft with the modern touch of the designer. It is described as a reflection of an assured 21st century confident woman, who is sensuous, determined and knows exactly what she wants, yet cherishes her Indian roots. The show was presented by the tea manufacturer Taj Mahal Tea. Anita Dongre loves drinking tea, in particular she likes the Taj Mahal brand's teas and that is why she said, “I think it is a good association”. But not only about her tea preference but this association it is also linked with her passion for Indian heritage and that is what she explained: “It is heritage yet contemporary and is a connoisseur's choice, which is why I have associated with the brand." 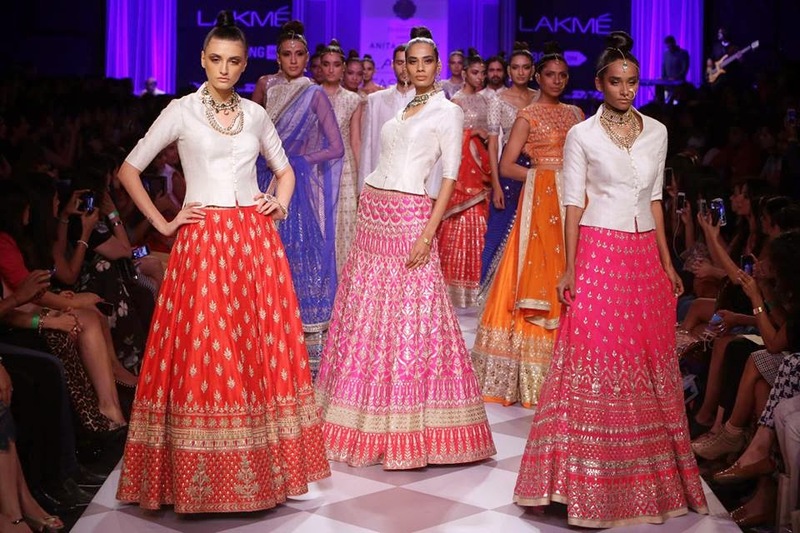 Want to see more videos about Lakme Fashion week? 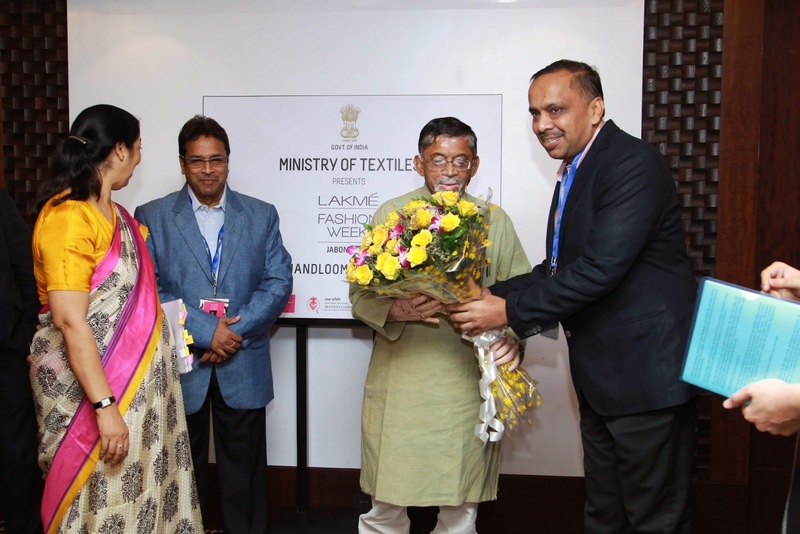 To celebrate the Indian Handlooms and Textiles day, Santosh Gangwar - Textile Minister, inaugurated the 2nd day of Lakme Fashion Week's Winter Festive 2014 edition. The celebration of this particular day was first introduced in the fashion show in 2012. Many thought that it will be just for once, like other projects in the past but 2 years, but this initiative has continued and its popularity has not ceased to grow. 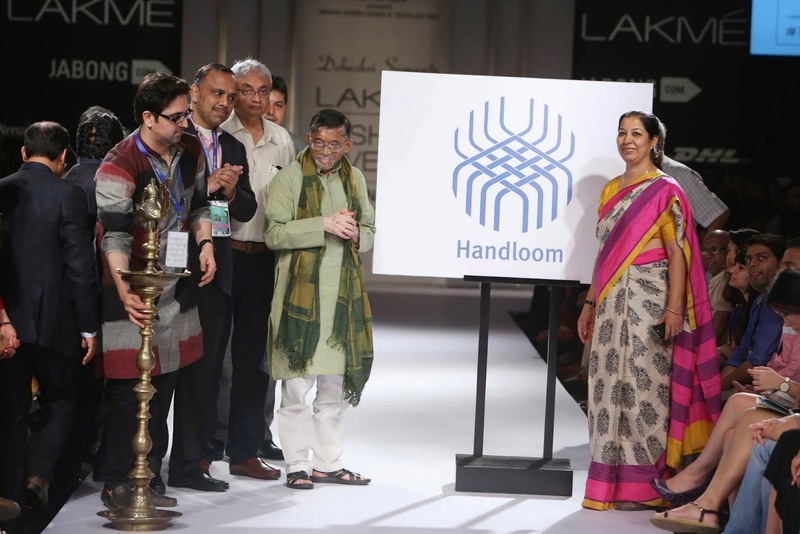 The spotlight was on handwoven fabrics like chanderi, tussar silk, khadi and honoured indigenous dyeing techniques and organic practices of the designers. The beautiful actress Shriya Saran walked on the ramp wearing a floral print sari with a lightly embellished scoop-neck green blouse and a nathni explained, "I always support handloom designs because I feel it's an art of India that is gradually dying out. I personally associate with Sashikant's use of organic fashion." - Show 5 : Marg by Soumitra, Vaishali S.
All shows had their individual mood and their own personality. From traditional to more contemporary or neutral to colourful, the beautiful collections of the designers had captured audience’s attention and proudly represented the ancestral know-how of India. 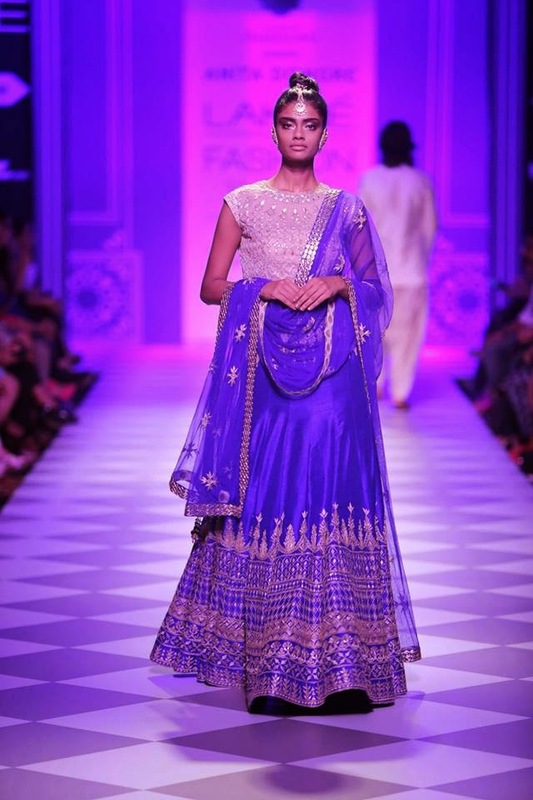 You want to see beautiful pictures of the Lakme Fashion Week Winter Festive 2014 and have more information? Why don't you have a look at a presentation about the Lakme Fashion Week Winter Festive 2014 collections presented on Day 1? See also Anita Dongre at LFW! Beautiful Bipasha Basu showed up at the Screen Awards 2014 wearing a blue, floor-length anarkali by the famous Manish Malhotra. What do you think of it? Love Indian accessories to have the same celebrity style? On the last day of Lakme Fashion Week, Bollywood actress Dia Mizra walked the ramp as a showstopper for duo designer Shyamal and Bhumika. She was wearing a beautiful red zardosi covered lehenga, a small velvet choli and a shimmering dupatta. 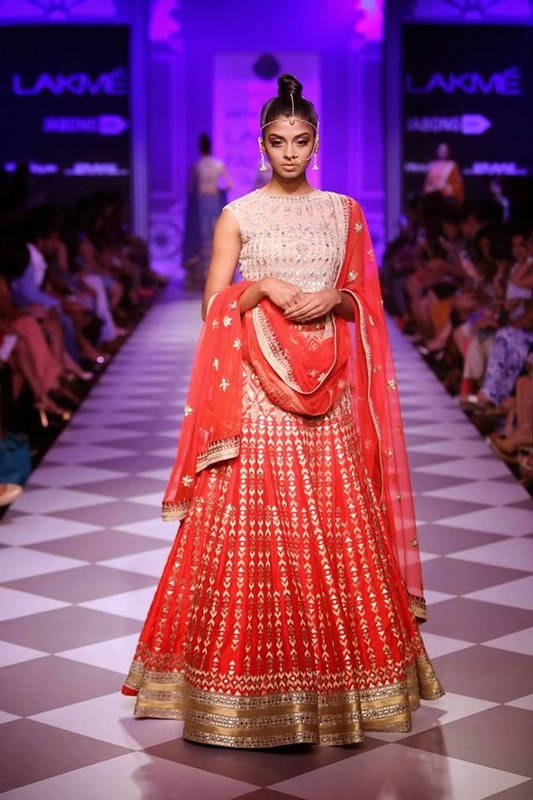 Indian bridal wear definitely looks perfect on Dia!